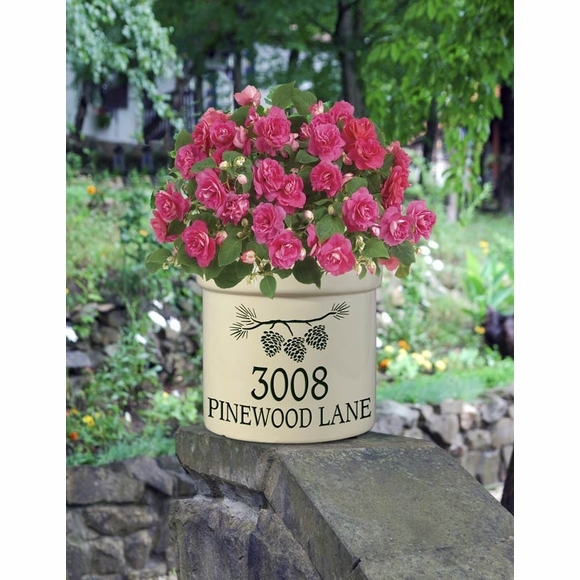 Personalized 2 Gallon Stoneware Address Crock - - decorated with two lines of personalization and a woodland theme accent. Made in USA. Stoneware crock is handcrafted from premium Tennessee clay and protected with a lead-free glaze. Detailed design and personalization are deeply carved and painted in weather-resistant finishes. Ideal as a house marker or planter for your entryway; a container for magazines and newspapers or kitchen utensils; or perhaps as an ice bucket or door stop. You can set up your stoneware crock as shown in the images above: as an Address Crock with house number on line 1 and street name on line 2 or as an Established Crock with a name on line 1 and EST. and the year on line 2. OR you can use lines 1 and 2 to say anything that does not exceed the character count. Line 1 holds up to ten (10) 1.75" characters including spaces. Line 2 holds fourteen (14) 1" characters including spaces. Dimensions: 9.75" diameter x 9" high; weighs 12 pounds; large 2-gallon capacity. Colors: blue, green, red, or black on cream background as shown above. Personalized stoneware crock is a wonderful personal gift and does double duty as a planter, newspaper bin, door stop, etc. Made in USA.